Jamie Whincup shaded Chaz Mostert by 0.01s in the first open Supercars practice session at Symmons Plains. In the first session since the pre-round parity changes, Red Bull Holden driver Whincup was a constant near the top of the time sheets. He first went quickest inside the first 10 minutes with a 51.086s, before being displaced by teammate Shane van Gisbergen's 50.973s at the 15-minute mark. 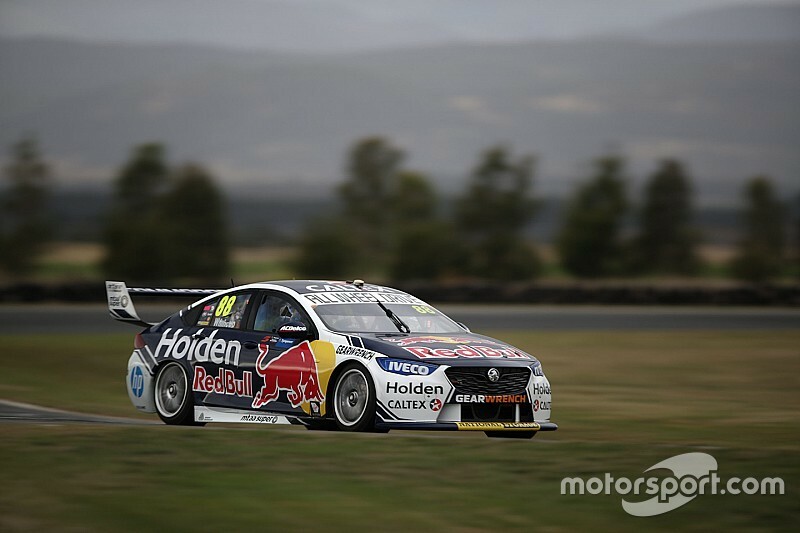 Both Red Bull drivers improved as the final third of the session kicked off, Whincup briefly going quickest with a 50.957s before van Gisbergen hit back with a 50.854s. In the closing seconds it looked as if they would both be trumped by Tickford driver Mostert, who put his Mustang on top with a 50.775s. However Whincup had the last laugh, a 50.756s right on the flag leaving him on top. “The car is okay, it’s reasonable, but it’s not as nice as we’d like," he said. "We’ll do a bit of work between P1 and P2 to try and improve it." Mostert and van Gisbergen were next, with points leader Scott McLaughlin battling a problem with his shift lights on the way to fourth. David Reynolds was fifth ahead of Mustang drivers Lee Holdsworth and Will Davison, followed by Scott Pye, and Fabian Coulthard, who made sure five of the six Mustangs were in the Top 10 with the ninth-best time. Anton De Pasquale was 10th, Rick Kelly the best Nissan in 11th, while Cam Waters was the slowest Mustang in 12th.